Zeke is in the cannabis biz and has been for much of his life. He cultivated his first plant in his Weber County home in 1997—the year after California became the first state to legalize medical marijuana. Even when he wasn’t growing marijuana, he was “always slingin’,” selling mostly California-grown product to a large circle of friends in Utah. That shop involved just two grow lights and no more than a dozen plants, but he earned about $4,000 per month in revenue from the operation. Laid off from his day job as new-home construction plummeted, his knowledge of how to turn his basement into a moneymaker was his salvation. “For two years, it helped me keep my house,” he says. Zeke is one of many who’ve moved from states that still prohibit marijuana to states that have decriminalized or even legalized the product with a doctor’s prescription. Industry watchers say thousands have moved from prohibition states to reform states for access to the herbal medicine; some Utahns also have moved west to pursue the American dream of providing that medicine to the masses. Other former Utahns, meanwhile, work tangentially in the cannabis trade by selling growing supplies, teaching cultivation classes or even testing marijuana products for contaminants and safety. One Utahn who moved to California in 2003 now sells and manufactures hydroponics-growing equipment through a Website and almost a dozen stores in several states. He employs 75 people in the United States, and an unknown number of workers in India and China, where his products are manufactured. He expects to generate $16 million in revenue in 2010. The Dopest Plea Deal Ever: Federal prosecutors may have too much power to decide who gets the dopest plea deals. More importantly, however, the path to Zeke’s American dream has not yet fully revealed itself. Hard times have hit Zeke before, and they could again. If he’s unable to start his own growing operation as planned, he could find himself down and out in California and needing to move back to Utah where he has family. If that happened, he would have his skills as a marijuana farmer to fall back on financially—but only if he stays on the down low. Even if things do work out as planned, he still needs to remain anonymous in this article because Utah could become one of his markets for sale of his buds—legalities be damned. “Harold” operates several of them in California. Harold, is a graduate of the University of Utah and lived in Utah for more than a decade. Utah’s proximity to outdoor recreation options was a big draw for him. “I love Utah,” he says, and he dreams of moving back, or to another state less crowded and better managed than California. In 2003, California called his name. A friend of a friend owned a small hydroponics-supply store and offered him a job. Before long, they were business partners. “We started out in a store that was less than 800 square feet, in 2003,” Harold says. “The first three years, we didn’t really do anything, but then we’ve been able to add one or two or three stores in any given year [since].” They have five new stores planned in the coming year. Harold is a pseudonym. Even though his business is entirely legal regardless of cannabis regulations—he sells only lights and chemicals, the same equipment a person could purchase to grow tomatoes or basil—that hasn’t kept federal law enforcement officers from investigating his business. He worries that those enjoying the most success are likely to be law enforcement pariahs if a new president—with more zeal for busting up the cannabis industry—is elected in 2012. It didn’t work. Subpoenas for financial records were all that ever resulted. Harold thinks about 95 percent of his customers purchase his products to grow marijuana—not tomatoes—but nothing he sells is actually contraband. There’s no criminal liability in selling products to marijuana producers, or everyone from power companies to grocery stores could be implicated. Still, he worries that proving his innocence could be a costly endeavor in court. This family man with a wife and child at home pays his taxes, he says—a lot of taxes. His employees pay state and federal income taxes, Medicaid and Social Security. He offers a 401(k) plan, health insurance and pays his employees for six hours of community-volunteer work each year. He donates to the community—about $18,000 this year to PeeWee football, local schools and other causes—and his marketing and advertising budget is a whopping $150,000 per quarter. Harold’s business is just one example of “spin-off effects” that are good for economic development, even if they are not directly involved in selling cannabis. 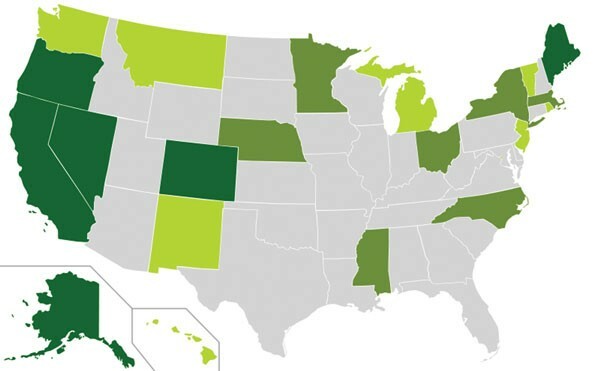 Many of those businesses grow around the cannabis trade itself—and thus have largely eschewed prohibition states for greener pastures.